Carlon® Fittings enable installation from inside or outside. Available in ½ in. gray and ¾ in. blue color coded, Carlon® Fittings come with 20-ounce tamper proof plastic packing. 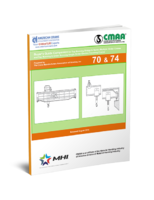 Meeting UL and CSA standards, units are non-metallic fittings suitable for electrical boxes. Enabling easy installation, fittings prevent movements within knockout. Carlon® fittings from Thomas & Betts (T&B), a member of the ABB Group, are among the only non-metallic fittings for electrical boxes that can be installed from either the inside or outside of the box. The new Carlon fittings are UL® Listed and CSA™ certified, and are certified for one or two sheathed cables. 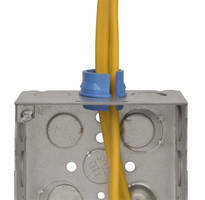 Two sheathed cables may be inserted through the fittings either together or one at a time. They are color coded for easy identification: ½-inch size is gray, ¾-inch size is blue. In addition to electrical supply distributors, Carlon fittings are available from retail outlets for homeowners and small electrical contractors. Carlon fittings are packaged in reusable, 20-ounce plastic containers that feature tamper-proof lids, shrink seals and grip indentations on the back. The containers are clearly labeled and can be stacked for display. For more information about Carlon Fittings, please visit www.tnb.com and select Carlon on the “Brands” tab, or call (800) 238-5000.